The Saga of the Inoffensive Men’s fragrance continues with Gucci pour Homme, a mixture of fresh and woodsy for the man who isn’t yet tired of smelling like a mixture of woods and spice. In Bottle: I can harsh on Gucci pour Homme for smelling like every other woody spicy fragrance for men out there but it really is a winning combination that, if worn properly, is like a formula for success. Well, fragrance success anyway. Its in bottle presence is a sharply fresh spicy woodsy scent. Applied: Spicy woods! The pepper in this lends a pleasant kick to the blend of woodsiness that predominates this fragrance. There isn’t a whole lot of originality to be had here. If you liked Dolce and Gabanna’s Light Blue pour Homme, you will find this a fairly good choice too. It differs, of course, with Gucci pour Homme having a cleaner and more detectable aromatic bay leaf note in it and a strong cedar and woody accord. The bay leaf sticks around in the mid-stage where it mingles with the woods and does a fine job making Gucci pour Homme smell decidedly masculine. Of course a woman could wear this too, but the marketing would have a fit as this was clearly made for a man to wear. It smells of clean dry wood and greenness. Like a man who spent the last three hours chopping down trees and making a very nice desk in the forest then took a shower. The dry down is likable enough with your typical woodsy cleaned up vetiver fade with a pretty nice leather note and a splash of warm amber thrown in for good measure. Extra: Just for a full dose of confusion there are three Gucci pour Homme fragrances that share similar names. Gucci by Gucci pour Homme. 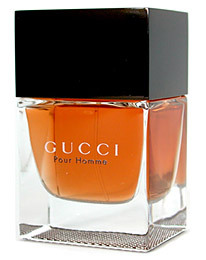 The one reviewed in this review, also called Gucci pour Homme, finally there’s Gucci pour Homme II. All of them smell different and look different. Gucci by Gucci pour Homme is bottled differently than the fragrance pictured here. Gucci pour Homme has an amber liquid and is the fragrance in this review. Gucci pour Homme II is bottled similar to this one only the liquid is blue. Design: I really like Gucci pour Homme’s design element. It’s a cube-like glass bottle that reminds me of how Chanel nail polish is bottled. Simple, clean lines, no frills. Just a nice minimalist design that functions well. Notes: White pepper, pink bay, ginger, papyrus wood, orris rhizome, vetiver, amber, white olibanum, leather. Gucci pour Homme is a very popular fragrance for men. You can probably tell why. Like with all men’s fragrances that lack in the originality sector, it is high in versatility and likability. You can wear this in the office, to the club, on the bus, to the golf game. Wherever it is your heart takes you guys and girls. Just a forewarning that Gucci pour Homme runs on the strong side, so ease up on your trigger finger. Reviewed in This Post: Gucci pour Homme, 2008, Eau de Toilette . This entry was posted in aromatic, fresh, gucci, Reviews By House, spicy, woodsy and tagged amber, cedar, clean, ginger, gucci, leather, orris rhizome, papyrus wood, pink bay, pour homme I, spicy, versatile, vetiver, white olibanum, white pepper, woodsy. Bookmark the permalink.